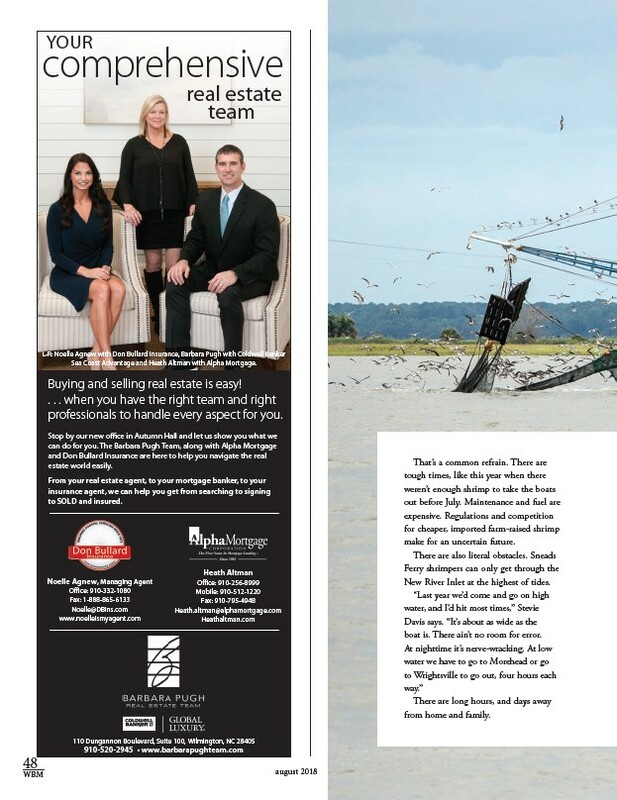 Your comprehensive real estate team L-r: Noelle Agnew with Don Bullard Insurance, Barbara Pugh with Coldwell Banker Sea Coast Advantage and Heath Altman with Alpha Mortgage. Buying and selling real estate is easy! . . . when you have the right team and right professionals to handle every aspect for you. Stop by our new office in Autumn Hall and let us show you what we can do for you. The Barbara Pugh Team, along with Alpha Mortgage and Don Bullard Insurance are here to help you navigate the real estate world easily. From your real estate agent, to your mortgage banker, to your insurance agent, we can help you get from searching to signing to SOLD and insured. Heath Altman office: 910-256-8999 Mobile: 910-512-1220 Fax: 910-795-4948 Heath.altman@alphamortgage.com Heathaltman.com Noelle Agnew, Managing Agent office: 910-332-1080 Fax: 1-888-865-6133 Noelle@DBins.com www.noelleismyagent.com 110 Dungannon Boulevard, Suite 100, Wilmington, NC 28405 910-520-2945 • www.barbarapughteam.com 48 WBM august 2018 That’s a common refrain. There are tough times, like this year when there weren’t enough shrimp to take the boats out before July. Maintenance and fuel are expensive. Regulations and competition for cheaper, imported farm-raised shrimp make for an uncertain future. There are also literal obstacles. Sneads Ferry shrimpers can only get through the New River Inlet at the highest of tides. “Last year we’d come and go on high water, and I’d hit most times,” Stevie Davis says. “It’s about as wide as the boat is. There ain’t no room for error. At nighttime it’s nerve-wracking. At low water we have to go to Morehead or go to Wrightsville to go out, four hours each way.” There are long hours, and days away from home and family.